This is a call for work – Artists, Thinkers, Creators – We seek your human-powered machines, bicycle-based inventions, and interactive kinetic sculpture. 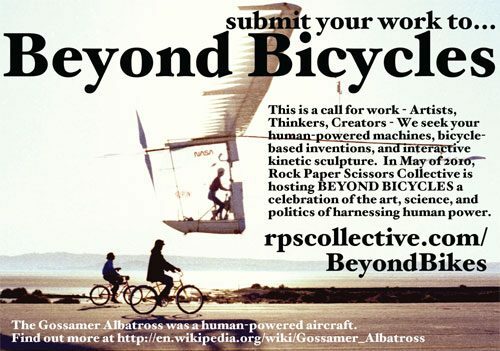 In May of 2010, Rock Paper Scissors Collective is hosting BEYOND BICYCLES, a celebration of the art, science, and politics of harnessing human power. Our inspiration is the bicycle, a simple machine that has transformed our experience of moving through the world. We see the bicycle as possibility, the tip of the big ol’ iceberg of human potential energy. BEYOND BICYCLES will be an exhibition documenting the many ingenious uses of human power past and present. The Gallery space at Rock Paper Scissors Collective is limited so large works will only be displayed during opening night. Our month long exhibition will consist of a collection large color photographs of works, accompanied by a printed zine. There will also be a web zine which will be more extensive than the printed version.